This guide was developed from a thorough review of literature and consultation with experts and practitioners. We drew on existing work on outcomes for young people and research on ‘employability’, including academic papers, research reports and various ‘grey’ literature. We met with employment advisors, government officials, programme managers and other experts to gain insights. To guide the development of the framework, we established an advisory group of 19 experts. The group met twice and provided additional input during the development process. A full list of acknowledgements is included at the end of this document. The tools have been tested throughout a piloting period from September 2013 to February 2014, and updated accordingly. Helping young people to find a job and sustain it is the ultimate objective of all organisations working to improve the employability of young people, even if they do not directly seek it through their activities. The government’s Work Programme pays providers for a ‘job outcome’ after a participant on the programme has been in a job for three or six months, and then again every four weeks for up to two years (depending on how far they are from the labour market). This definition of a ‘job outcome’ is simple and widely used across a range of employability programmes. However, for some organisations working to help young people into work, this definition is too narrow. It tells us nothing about how young people reach this point, and the journey they have to make to get there. Moreover, getting a job is not the end of this journey. Ideally, they will have productive and fulfilling careers in their chosen area. Below we explore a broader definition of job outcomes. The definition of a job outcome as getting a job and sustaining it for a set period of time is appealing in its simplicity. But once in work, young people’s experience and the fulfilment they get from their job is also important. This means quality of work—for example, salary, job satisfaction, and opportunities for progression—could (and perhaps should) be recognised in a broader definition of a successful job outcome. A large number of personal circumstances are linked with a young person’s ability to find and sustain work. The outcomes factors listed below are not exhaustive, but include the main issues emphasised in the literature. Availability and cost of transport can be a significant constraint, hindering job search activities and the ability to sustain employment. It is an issue that disproportionately affects young people and varies according to where they live. Access to the internet is important for finding, gaining and sustaining work. Those who have access to the internet are more confident in their ability to get a new job, and find it easier to access careers advice. Inspiring Impact: Journey to EmploymenT (JET) framework NEET group and have lower prospects of securing employment, as well as lower average wages. Young people with mental health disorders can suffer disruptions to their education and early career, and are less likely to be employed as an adult. Risky behaviours are associated with greater likelihood of being not in education, employment or training, although the relationship between cause and effect is often unclear. 71% of young people who are NEET report using drugs, compared with 47% of their peers. Unemployed people are more likely to commit crime, and offenders are significantly more likely to be unemployed than the general population. It is not always necessary or possible for an individual to fully and permanently overcome these circumstances to enter work. Evidence from the Department for Work and Pensions (DWP) employment support programmes suggests that in some cases marginal improvements can be enough to help someone secure a job. However, difficulties are likely to continue or re-emerge in employment, and may require on-going management and support. Access to transport: a young person is able to travel to access employment and training opportunities. Access to the internet: a young person has access to the internet for education, training and job search. Access to childcare: a young parent is able to manage responsibilities for caring for children alongside education, training and employment. Access to support for young carers: a young person is able to manage unpaid responsibilities for caring for someone who is sick, disabled or elderly alongside education, training and employment. Access to support for young people with physical and mental health problems: a young person with physical or mental health problems has improved access to education, training and employment opportunities. Reduced substance abuse: a young person has reduced levels of drug and alcohol abuse. Reduced offending/anti-social behaviour: a young person has reduced levels of offending/anti-social behaviour. Emotional capabilities are essential to live and work independently. A young person’s outlook on life is known to impact upon education and employment outcomes. Young people with low self-esteem are less likely to attain post-secondary education and to be employed 14 years later.Poor self-esteem is linked to job quality and degree of supervision in a job, and can be a good predictor of future earnings. An individual’s ‘locus of control’, or the degree to which they feel they have autonomy over their life, is also associated with earning potential. Studies have shown that possessing grit, defined as perseverance and passion for long-term goals, is linked to successful educational and career outcomes. Research suggests that these characteristics are a more accurate predictor of a child’s academic and occupational success than cognitive ability. Empathy, a person’s ability to understand and appropriately respond to their own and others’ emotions, is an important attribute when working with others. Employers place great value on emotional capabilities such as empathy, particularly as the number of service sector jobs increases. Self-esteem: a young person has an improved perception of his or her own value or worth. Autonomy and control: a young person has increased confidence in their ability to affect situations and have control over the direction of their life. Grit and determination: a young person has increased perseverance and passion for long-term goals. Empathy: a young person has an improved ability to understand the emotions of themself and others and respond appropriately. Aspirations are important to motivate young people and provide a sense of purpose during their journey to employment. There is a link between educational aspirations and attainment: young people with higher educational aspirations exhibit greater motivation and attainment than their peers, as do those whose parents hold higher educational aspirations for them. Aspirations are also directly linked with likelihood of being in education, training or employment. Research using data from the British Youth Cohort Survey has found that young people with uncertain occupational aspirations, or aspirations misaligned with their educational expectations, are more likely to become NEET by age 18. Uncertainty and misalignment are both more widespread and more detrimental for those from poor backgrounds. Having a positive attitude to work is linked to improved employment outcomes. More than two fifths (42%) of 14 year olds who disagree strongly that having a job or career is important are NEET four years later. In recent national surveys of employers, having a positive attitude and being motivated was identified as one of the attributes most lacking in education leavers. Other studies endorse this view, with employers reporting that they place more value on a good attitude than on basic skills when hiring low-skilled workers. Aspirations: a young person has ambitious but realistic goals for the future. Attitude and motivation to work: a young person has an improved outlook in relation to work, positivity towards getting a job and the idea of working for a living. Aspirations for the future: a young person has positive aspirations for the future and feels confident they can achieve what they set out to. Employability skills have an important bearing on success in the workplace, including future earnings. These skills, such as team working, communication, problem solving, and self-management, are highly valued by employers, often far more than educational qualifications.34 The Confederation of British Industry’s annual employer survey consistently rates employability skills as the greatest priority when recruiting graduates, with 82% of respondents valuing these as important in 2011.35 Many of these employers believe employability skills need improving. 55% reported that they were not satisfied with the self-management skills of school and college leavers, and 43% were not satisfied with problem solving abilities. The same survey also found that the development of employability skills is rated by employers as the highest priority for 14-19 education, ahead of standards of literacy and numeracy, and science and maths skills. Research in the U.S. has found that non-cognitive traits among high school students, including leadership, industriousness and perseverance, predict higher occupational attainment and earning.36 There is also evidence that individuals who develop leadership skills through holding positions at school are more likely to occupy managerial occupations as adults, and command higher wages. Teamwork: a young person is able to work effectively with others. Communication: a young person is able to effectively convey their opinion and interact with others. Problem solving: a young person is able to generate ideas and develop solutions. Self-management: a young person is able to organise themselves and their workload effectively, including timekeeping and planning. Leadership: a young person is able or has potential to organise and provide direction for a group of people to achieve a common goal. Experience at school, college or in training, and what young people achieve during this time, has a significant effect on their future success in the workplace. Poor basic skills are associated with long-term unemployment. People with poor numeracy skills are more than twice as likely to be unemployed as those who are competent at numeracy. 63% of men and 75% of women with very low literacy skills have never received a promotion. IT skills are also linked to employment prospects, both due to the importance of IT in applying for jobs, and as a competency needed in the workplace. A survey by The Prince’s Trust of 1,378 15-25 year olds found that young people who are NEET are significantly less likely to use computers for job-search related tasks than their peers, largely due to a lack of confidence. 17% of the NEET young people surveyed believed that they would be in work if they had better computer skills. Achieving qualifications is linked to employment prospects and earning potential. The higher an individual’s qualifications, the more likely they are to be in employment. Fewer than half of those with no qualifications are in work, compared to nearly 90% of those with graduate-level qualifications. For example, some employers will only recruit graduates. Research has shown that the majority (60%) of large employers think that qualifications are a good indicator of the skills they require when recruiting. Analysis of data from the UK’s national Labour Force Survey also shows links between the highest level of qualification gained and an individual’s earning potential. Employees educated to A Level or equivalent earned on average 15% more per hour than those educated to GCSE level, while those with a degree or higher earned around 85% more than those educated to GCSE level. Attendance and behaviour can impact upon educational attainment, and in turn, employment prospects. Poor attendance at school is associated with lower academic achievement: only 3% of children who miss more than 50% of school achieve 5 GCSEs at grades A*-C, compared to 73% of students with 95% attendance or higher. Persistent truants are over five times as likely to become NEET at 16 than those who never played truant. Self-reported misbehaviour has been shown to have a negative influence on performance at GCSE, and links to a greater chance of being NEET at 16-18. Young people excluded from school are particularly likely to be NEET, with 21% of those excluded in years 10 or 11 NEET at age 16. Basic skills: young people have improved basic skills in literacy, numeracy and IT. Achieving qualifications: young people have improved performance in academic and/or vocational qualifications, which demonstrates an individual’s competency. Attendance and behaviour: young people have an improved record at school or college, including whether they are present and their conduct. Employers identify experience of work as one of the areas most commonly lacking among education leavers.Work experience gives young people valuable understanding of the workplace and the conduct expected of them. It can also help them make career choices, set realistic aspirations, and develop employability skills. Work experience gives an important signal to potential employers, particularly if it is paid. Working part time during school reduces the time young people are not in education, employment, or training after compulsory education by one day for every hour a young person works in a year. Work experience is also important for expanding a young person’s employer networks. There are links between the number of contacts a young person has had with an employer while at school and their confidence in progressing towards ultimate career goals, likelihood of whether they are NEET, and earnings if in work aged 19-24. The quality of work experience is important: poor quality experience can reinforce low aspirations, particularly for young people from disadvantaged backgrounds. A young person’s perception of the value of work experience can be an indicator of quality. It has long been recognised that employers select candidates on the basis of a variety of experiences. Community involvement can help to enhance employment prospects through building skills and experiences. Labour market pressure is a key part of young people’s decision to become involved in extra-curricular activities, so that they can add value to their employment credentials and match employers’ expectations. This motive is stronger for volunteering and for young people holding leadership positions (as compared to sports or artistic activities). The benefits of volunteering include increased self-esteem and confidence, but the link between this and finding a job has not been established. Qualitative research suggests that volunteering can increase employability among jobseekers, but that this increase depends on the quality, support and training available. Work experience: a young person has experience of the workplace (paid or unpaid). Perceived value of work experience: a young person thinks their experience is valuable, helping them to develop skills and gain knowledge. Networks: a young person has increased employer networks. Community involvement: a young person is involved in activities in the community. Researchers agree that securing employment increasingly relies on young people having the knowledge, ability and adaptability to navigate the opportunities available. People with confidence in their ability to perform career management activities are more likely to be active jobseekers, have strong career identities, and a greater success rate of converting job interviews into job offers. Career direction—the ability to make career choices and set realistic aspirations—is important for a successful transition into employment, and career progression. Research has found a strong correlation between career uncertainty and NEET status aged 16 to 18. Having clear and realistic career expectations is linked to improved adult employment outcomes. Career direction competencies include self-awareness (the ability to diagnose abilities and occupational interests), knowledge of relevant career opportunities, and the ability to develop a strategy to pursue career goals. Young people require job search skills to identify and pursue employment opportunities. This can include using newspapers and the internet to search for opportunities, using employment agencies, and asking family and friends. To secure a job, a young person needs to be able to effectively present themself to employers. This may be through a written CV or application form, or a face-to-face interview. There is no clear evidence on what type, how many and what intensity of job search and application approaches are most effective—this varies according to context. Some studies suggest that increasing the number of different methods of job search increases the chances of finding a job, whereas other studies find no link and indicate that there may even be a negative relationship. Research does show that an individual’s confidence in finding employment, their ability to perform job search skills and effectively present themselves to employers is linked to improved outcomes. Young people wanting to take control of their careers may decide to become entrepreneurs. This approach to career management requires young people to identify the market in which they wish to operate and establish a business venture. Recent OECD statistics reveal that 13.9% of employed people in Great Britain are self-employed, illustrating that entrepreneurship can lead to positive job outcomes. Career direction: a young person is able to formulate realistic career goals, and plan how to achieve these. Job search skills: a young person has the skills to search for employment and uses these in practice to look for work. Confidence in finding employment: a young person feels they have the right skills to find a job and that it is within their power to secure employment. Entrepreneuship: a young person has the interest and confidence to set up their own business. Entry into employment, sustaining employment and starting a business are often the main measures of success for employability programmes. 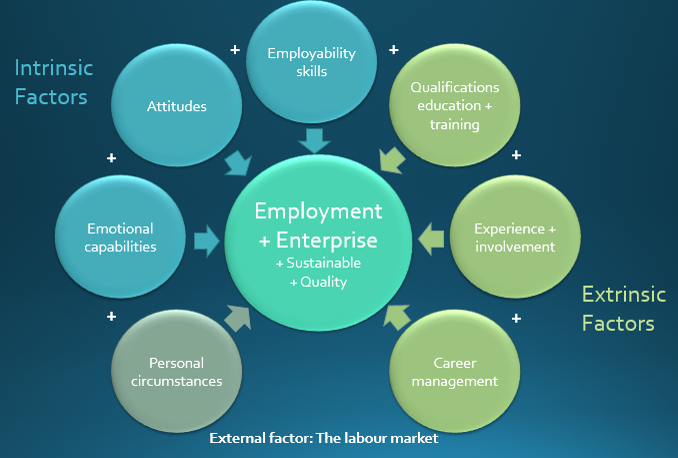 However, the quality of employment has important implications for individual, social and economic wellbeing. Pay, hours and employment security, plus training opportunities, indicate job quality. A regular salary and job security provide a basis for individuals to invest in their future—for example, to save up for a deposit on a house or begin a family. Job satisfaction is also an indication of the quality of employment, including fit with a young person’s skills and aspirations. Multiple research studies have found that job satisfaction is an important factor in influencing a worker’s health, particularly their mental health. Job satisfaction also impacts upon overall life satisfaction, family relationships and lifestyle choices. Entry into employment: a young person enters paid employment. Starting a business: a young person establishes their own business. Sustaining employment: a young person remains in paid work for a minimum number of cumulative or continuous weeks. Quality of employment: a young person enters employment that meets [specified] quality standards. Young person’s satisfaction with employment: a young person shows a certain level of satisfaction with their job. Once you are clear about the objectives of your work and what outcomes you want to measure, the next step is to work out how to do so. The JET Framework contains a series of tools covering each aspect of a young person’s journey to employment identified in the JET framework that can be photocopied. These measures have been drawn together from existing sources. The type of tool differs depending on what is being measured. Psychological scales are short questionnaires designed by psychologists and sociologists to measure subjective feelings, beliefs and attitudes, such as self-esteem or empathy. They usually include a series of statements, with respondents indicating on a scale the extent to which they agree with each (for example, see the measures for emotional capabilities). Psychological scales are the most robust way of demonstrating change in intrinsic outcomes, such as self-esteem or attitudes. They are designed to be objective and produce unbiased results, and are rigorously tested for validity and reliability. Importantly, they cannot be altered or changed as every statement in the scale is given a value, which is added together to produce a total score. Extrinsic outcomes such as educational attainment and entering work are – compared to intrinsic or soft outcomes – easily observed, and can be measured by asking young people to report on their activities and behaviours or by getting data from other parties, such as schools. Where there is not an established scale for analysing an indicator (for example, career direction), we have compiled relevant questions from existing sources, based on what the evidence suggests are the most important elements influencing youth employability. These can include both psychological scales and activity measures, and sometimes a combination of both. Where possible, we have selected questions from government surveys as these have been thoroughly tested for validity and reliability, and large national datasets are available for comparison. To gather data for programme evaluation the tools listed above can be incorporated into a questionnaire for young people to complete. This can be paper-based or use online survey software. For the purposes of programme evaluation, questionnaires usually only work if they are completed anonymously and without interference from anybody else (including an employment adviser or youth worker). This is because people are likely to respond in a socially desirable way if the questionnaire is not anonymous, which can compromise the results. The tools included in the JET framework have been chosen based on our assessment of robustness, cost, and ease of use. They are free to access and, where possible, comparison datasets are available. We have also tried to identify tools that are applicable to the widest age group possible, so they can be used by organisations working across the field of youth employability. In some cases this has meant selecting less robust tools.